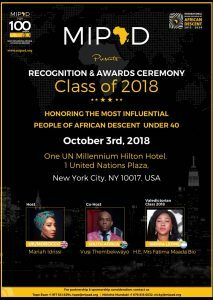 NEW YORK CITY, October 1st, 2018 – In support of the United Nations International Decade for People of African Descent 2015-2024, the Most Influential People of African Descent (MIPAD), a global civil society initiative, will honor young high achievers of African descent from around the world. This prestigious event will take place on October 3rd 2018, 2-5pm at the One UN Millennium Hilton Hotel in New York City, following the opening of the 73rd Session of the UN General Assembly. The recognition and awards ceremony for MIPAD Class of 2018 will recognize and celebrate the contribution of over 200 high achievers based inside Africa and across the African diaspora, selected based on their political clout, business acumen, social media following and humanitarian endeavors. This year’s list includes well-known African names such as Cassper Nyovest (South Africa), award-winning artist Folarin ‘Falz’ Falana (Nigeria), renowned actor Chadwick Boseman (USA), adventurer Mario Rigby (Turks and Caicos Islands), super model & fashion Icon Armando Cabral (Guinea-Bissau), Momentum Education Executive Director Robinson Lynn (USA), movie sensation Omotola Jalade-Ekeinde (Nigeria), power couple Erico Bras & Kenia Maria (Brazil), Colin Kaepernick, the American football quarterback, the French national football team for their 2018 world cup win and the cast and directors of Black Panther. Hosting the event this year are 2018 MIPAD honorees Mariah Idrissi, a British/Morocco model and cohost Vusi Thembekwayo, Managing Partner of Watermark Afrika Fund. The MIPAD Class of 2018 valedictorian speech will be delivered by Her Excellency Mrs. Fatima Maada Bio, First Lady of Sierra Leone. 2018 MIPAD honorees Chichi Nwoko of Kwese Free Sports, Kian Brown of The Brand Elevator and co-founder of The Maroon Society are other notable co-hosts. The premium event will showcase the achievements of the 2018 honorees representing more than 50 countries across the globe, coming to New York to make a business and social connection with their counterparts. This power networking event between 100 of the best and brightest based inside Africa and 100 based in the diaspora is set to ignite a collaboration between Africa and the diaspora in a way that we haven’t seen in a long time. As part of the event lineup, there will be a screening of the blockbuster Marvel film Black Panther at the United Nations headquarters with Hannah Beachler, an American film production designer known for her Afrofuturist design direction on the groundbreaking Marvel movie. Award-winning Nigerian actress Omotola Jalade-Ekeinde will also engage in a discussion on the future of film and media collaboration between Africa and its diaspora. Major announcements to be made at this year’s event, include the launch of an impact initiative, TechSOLVES.org, as a platform where MIPADians can join the UN and the global community and leverage technology to achieve all 17 UN Sustainable Development Goals (SDGs). MIPAD will also highlight the work of Class of 2018 honoree Mario Rigby as it continues to draw the world’s attention to the international decade. Having completed an epic walk from Cape Town to Cairo between 2015 and 2017, Mario Rigby ‘The Explorer’ is planning to embark on a two-year walk from Africa to the Americas to retrace the steps of the victims of the transatlantic slave trade. The founder of MIPAD, Kamil Olufowobi has stressed on the strategic importance of MIPAD as a “vehicle to build a progressive network of civil society actors who come together and support the implementation of the UN International Decade for People of African Descent”. He goes on to explain that “this global initiative presents an opportunity for people of Africa to mirror their success in new markets by connecting with their counterparts who have a similar track record of success in Africa and across the diaspora”. “Our honorees transcend race and their global achievements in media, music, movies, fashion and sports impacting popular culture, are changing the narrative about Africa and its diaspora by highlighting excellence worldwide,” Olufowobi adds. Currently, it is estimated that there are approximately 200 million people who identify as being of African descent living in the Americas. There are many millions more who are spread across the world outside of the African continent. The promotion and protection of human rights of people of African descent has been a strategic priority for the United Nations and the International Decade for People of African Descent proclaimed by General Assembly resolution 68/237, and to be observed from 2015 to 2024, provides a framework to elevate and acknowledge the significant accolades achieved by people of African descent around the world. Nominations for Class of 2019 opens Oct 5th to learn more here . In support of the International Decade for People of African Descent, the Most Influential People of African Descent (MIPAD) identifies high achievers of African descent in public and private sectors from all around the world as a progressive network of relevant actors to join together in the spirit of recognition, justice and development of Africa, its people on the continent and across its diaspora. MIPAD publishes a global 100 list that identifies high achievers of African descent in public and private sectors worldwide, 100 inside Africa, 100 outside Africa in the Diaspora across four categories; Politics & Governance, Business & Entrepreneurship, Media & Culture, Humanitarian & Religious. And, we will be releasing the list annually until 2024.